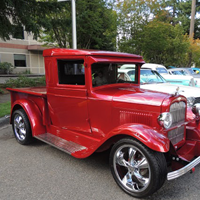 From 9-3 on Saturday, September 19th Huntamer Park will be swarming with collector cars of all sorts. Jump start your day with Saint Martin’s and their Alumni breakfast. Cruise into the afternoon with vendors such as the Nisqually Red Wind Casino, Rick’s Wood Work and so much more. Stop at the Taco Bus for a quick bite to eat and cast your vote for your favorite car. The winning favorite will be on next year’s promotional items for the event! Enjoy Bobby Sox & the Juke Box band live on stage from 10-2 while you peruse the award winning cars!